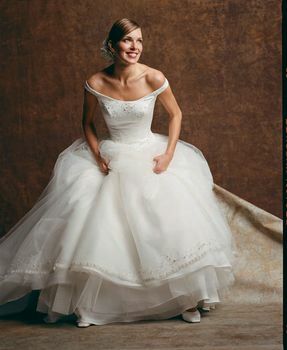 This ballerina style gown has a full tulle skirt and chapel train. Beautiful off-the-shoulder neckline is highlighted by delicate embroidery and romantic beadwork complimenting that used on the basque waistline. Hand beaded trim on hemline completes the fantasy of this Cinderella gown.